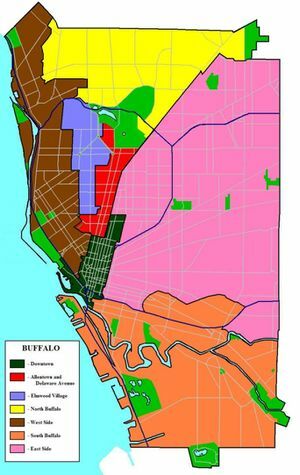 At right is my proposal for dividing the Buffalo, New York article into districts in accordance with the Huge City template. The image is based on an August 2009 Buffalo Rising article "Buffalo Neighborhoods: What Defines Them?" with additions and alterations by me. I feel that each of these eight districts are the proper size to ensure the emergence of individual district articles that are robust without being overlong. I eagerly await any suggestions or comments my fellow travellers may have. I have written several of such articles, but usually try to find some way to unite them in the lede (e.g., Chicago/Bridgeport-Chinatown and Washington, D.C./Adams Morgan-Columbia Heights). I don't know enough to comment on the particulars of the district boundaries, but the article is clearly ready for districting. I can comment on roughly how many districts it ideally would have, though, based on Wikitravel_talk:Geographical_hierarchy#Optimal_districts_schemes, and it looks like this might be a little much. The content/districts is actually pretty acceptable at 33,300 (6 articles, by combining the three as suggested above, would be an even better 44,400), but 8 districts for an American city of 200,000 would be unusual. Maybe the best comparison would be with Baltimore, which is a little more than twice the size and three times the population of Buffalo. It has 9 districts, but I would say its ideal number would actually be 8 (if it were possible to do so with a sensible breakdown). This is all just metrics, though—each city will have its own needs. I'm quite sure that both of those articles will stand on their own quite well, especially North Buffalo. North Buffalo has Hertel Avenue, Parkside, University Heights, the Zoo, and the Parkside Lodge. The West Side has the Buffalo Religious Arts Center, riverfront parks, a few B&Bs, shopping along Grant Street, and some architectural stuff that I haven't gotten around to yet. In the district articles, I plan to elaborate greatly on the Architecture section of the current article - perhaps something like itineraries for self-guided walks down Delaware Avenue or through Parkside. Funny that you should mention photographs, as I am an amateur photographer whose work focuses on local architecture and urban scenes. I did not open my Wikitravel Shared account until I uploaded the districtification proposal map, so I fully plan on including some of those. The article uses the phrase "Western New York" a few times but fails to define it. In most cases, that's fine, but there are a couple of instances where it may be misleading. As stated on the Western New York disambiguation page, the term is ambiguous. To quote myself: "In Buffalo and its immediate surrounding areas, the term encompasses only the westernmost eight counties of New York. As you go farther east, though, the definition generally expands accordingly. Rochester, for example, is usually considered to be part of Western New York everywhere except in Buffalo. At the extreme, some residents include Syracuse in the area, although it's more often considered part of Central New York." The listing for the Buffalo Zoo claims it as the second-most popular tourist attraction in WNY. This is only true if Rochester is excluded from the definition, as The Strong's National Museum of Play hosts over half a million visitors a year compared to the zoo's 400,000. The Buffalo Greek Fest is claimed to kick off the summer festival season in WNY, but the Lilac Festival in Rochester is even earlier and serves the same purpose in the Rochester area. The Robeson Theater is claimed as the oldest African-American theater in WNY. That claim comes from the theater itself, so it's understandable to use it here -- but it's confusing to readers who don't know what definition of WNY is being used. The Theatre of Youth is supposedly the only theater company in WNY devoted to kids' theater, but again, this is only true if you exclude Rochester. I'm not looking for this article to include a detailed discussion of the term's ambiguity, but I wanted to point out a few cases where the ambiguity may be problematic. Let me know if I'm way off base here. The definition of "Western New York" as used in my contributions does indeed correspond to the eight counties mentioned in the disambiguation article, and excludes Rochester, being the western extremity of the Finger Lakes and as such distinct from WNY as far as my writing is concerned. As you mentioned, this is the dominant understanding of the definition of "Western New York" among Buffalo residents — so much so that the fact that this is not THE dominant definition among all New Yorkers actually comes as something of a surprise to me. This is an interesting issue you've brought up. I think it might be good to address it briefly in the article itself, and would be open to suggestions as to how to do so in a way that is comprehensive enough to allay any confusion that might crop up, yet not end up being a long and distracting tangent. I noticed that the eight counties defined as "Western New York" in the Buffalo article correspond to the combined "Greater Niagara Region" and "Chautauqua-Allegany Region" as defined by New York State's official tourism website . Though these terms (especially the former one) are arguably even less well-defined in common usage than "Western New York", perhaps the facts that 1) the New York State government is about as authoritative a source as you can find on this subject, and 2) NYS does have clear definitions for "Greater Niagara Region" and "Chautauqua-Allegany Region", are enough to make a reoriention of those references around New York State's terminology preferable to continuing to deal with the ambiguity of "Western New York". In my own writing here on Wikitravel, I've used (admittedly) somewhat awkward constructions explicitly to avoid using the ambiguous proper noun, like "the westernmost part of New York" or "the Niagara Frontier". This is an excellent Wiki document on Buffalo, NY. Would it be OK to add this new topic so that WNY-ers can post potential updates? If yes, may I mention that I believe that the Ira G. Ross Niagara Aerospace Museum is no longer in the Arena (First Niagara Center) as they had to vacate when the new owner of the Sabres wanted to make improvements? I don't know the status of their search for a new facility other than they hope to find something near the Buffalo Waterfront. I'd love to see the old DL&W train terminal become a multi-museum facility, but I guess that'll never happen in my lifetime. Thank you in advance for allowing this new topic! This page was last edited on 19 September 2012, at 03:12.